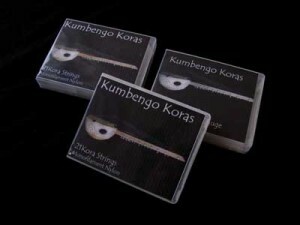 In response to numerous requests we decided to offer sets of Kora Strings as well as individual replacement strings. This is the same material we use on our custom built koras, made from high quality, instrument grade, monofilament nylon. We put together five different sets, extra light to heavy. Each set contains 11 gauges of string, carefully balanced to provide even temper over the entire range of the kora. The sets are comprised of solid strings ranging from .020 through .060 as well as custom wound bass strings from .071 through .096. 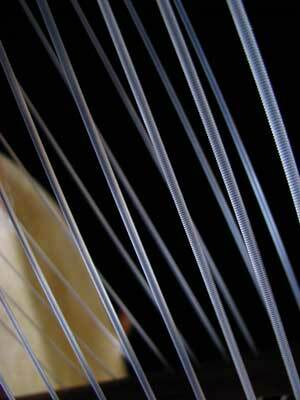 The strings are packaged by gauge and numbered to allow for easy installation. We include instructions that let you know which strings go where. We mainly use the heavy gauge set on our koras when they are tuned to G or F, lighter sets as we go higher, up to the light set which we use for koras in C. However, we advise players to choose lighter sets unless all doubt about the structural integrity of the individual instrument may be safely dismissed. In general, heavier strings provide a warmer, mellower sound but require greater tension to achieve maximum volume, lighter gauges tend to be brighter but require less tension. 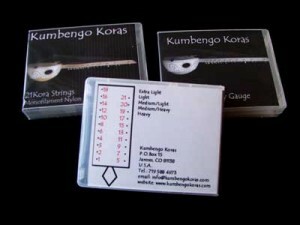 We also offer a universal set for players who wish to experiment with different string gauges. This set includes all 11 gauges of solid string plus 4 different gauges of wound string. We will gladly assist in the selection of the proper string gauge for your instrument.